Car crash alert! Literally. 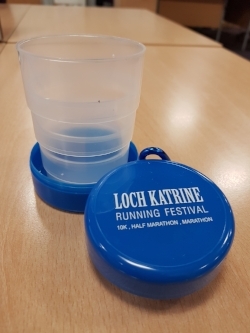 You would have thought it would get easier with each year that passes, but no, the path to getting the Loch Katrine Running Festival over the start line this year has been littered with caltrops waiting to trip me up. Preferential entry for a group – err no, take your chances along with everyone else. Is there a waiting list – err no. I didn’t get in can you put me on the waiting list – there is no waiting list. Can I swap my entry over to my mate – err no. Can I swap race – maybe, why?. I entered a race because the one I wanted was full and thought I could just swap – what! Then there was the ‘your logo won’t fit on the print space’ problem. The courier lost your order of medals and race numbers four days before the event. We no longer know how to set the road barrier at Stronachlachar to stay open admission the day before the event. Which you would understand if that was me but not really when it is the people who ‘own’ the barrier. There was the mini ‘Jonesey’ ‘DON’T PANIC’ moment when a bit over a week to go the news that the Brenachoile café would not be open due to a sudden change in management. Everyone rallied round to come up with a contingency plan; and there was a fantastic and mammoth effort made by the Trossachs Pier management to get the café open, which was greatly appreciated by one and all. Route marking: that should be easy enough to do: right? The weekend before we had gone up both days and successfully measure and marked out the routes. Alasdair walked the 10k and I ran the half and marathon routes getting some valuable training. A successful weekend with no mishaps other than a lost pair of scissors. We can cope with that. Day before race day. Three of us pile into the car with various GPS devices, a pile of assorted mile markers and cans of spray paint. After a bit of faffing we get into a rhythm and all is going well. 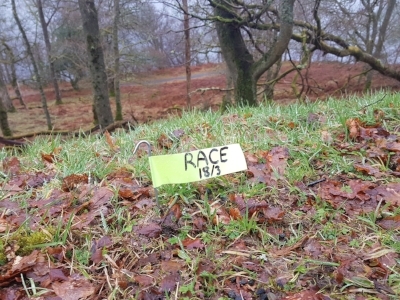 I even found the scissors: lying at the bottom of the loch at the 1k marker. Right let’s put my not yet two-week-old sport model through its paces up the loch side. Vroom! Oops, got that a bit wrong. No, joking. I am not that cavalier. We lost the Mexican stand-off with a 4x4 pick-up and cracked first giving way to them manoeuvring onto the verge. They sped off, no acknowledgement, no pause to check that we got off the verge. A wide, low profile sport model is not really designed for these situations. Soon finding ourselves unable to go forward or back: damn! Help was sought and came in the shape of Karen and Breandan from the local steading - Glengyle Cottage. Right, time to call ‘Swiss Mike’. ‘Swiss Mike’? He will know what to do. He does this all the time. About 45 minutes later Swiss Mike arrived. He calmly assessed the situation and came up with a plan. Front tow, four people in back and boot to add weight to get the wheel back on the ground, owner driving. He then explained what I needed to do. Katherine asked if I was OK with this? 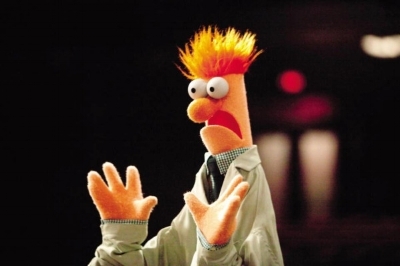 Beaker moment! No, I was not! Quite apart from anything else I have problems distinguishing my left from my right at the best of times. If I got that wrong here the car was going into the loch. Everyone was a bit surprised that the ultra and adventure runner was showing fear and doubt. A few deep breaths later, and having established that it was ‘thumb ring hand’ down when instructed, I was in the driver seat and the tow rope was taught. The car was moving, the wheel was back in contact with the road and I got the steer right. Team work won the day and I cannot thank Karen, Breandan and Swiss Mike enough. There was a fair amount of shocked laughter afterwards and consumption of copious quantities of comfort food and sugar at the Pier Café. That evening word was spreading that events across Scotland were getting cancelled due to the imminent arrival of the ‘mini beast from the East’. You must be joking. To cancel or not to cancel? Race location was outside of the warning area everyone had been warned not to use the Duke’s Pass road which is impassable in icy conditions. The weather on Sunday was set to improve. It might be tricky first thing. Even if I cancelled not everyone would get the notification. I was going to have to go up regardless. Right, lets go ahead, assess conditions on the day and see who pitches up. It was a bit tricky getting there with bands of snow crossing the country but generally OK in the Callander and loch area. There was a dusting of snow at the loch. It would be the marshals and the runners call. If the runners wanted to run and the marshals were happy to go down the road and set up the water stations it would be all systems go. Back-up plan: a 10k for everyone. Happy to say, it was all systems go. The day went well despite the weather, which did improve, we got 248 happy runners over the line, presented with medals, photographed and fed and watered. Well done and thank-you to everyone. It just shows that a bit of faith, good will and team work can succeed and overcome pretty much anything.